Hope everyone had a lovely Thanksgiving. Ours was a nice trip out of the city back to the Skeptic’s family farm. I often forget how nice the quiet is out there. I returned to some wonderful packages! 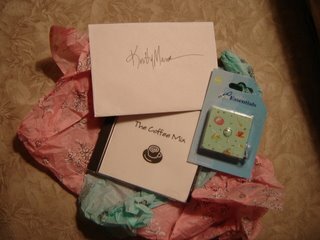 First, Chris at Stumbling Over Chaos sent me the best package as a thanks for doing the coffee swap: a sweet note, cute tape measure (which I was in major need of!) and a kickin’ coffee themed CD mix. The Skeptic and I both enjoyed the CD tonight. I love a great mix, and this is the best I’ve gotten in years!!! Thanks so much! She really spoiled me. 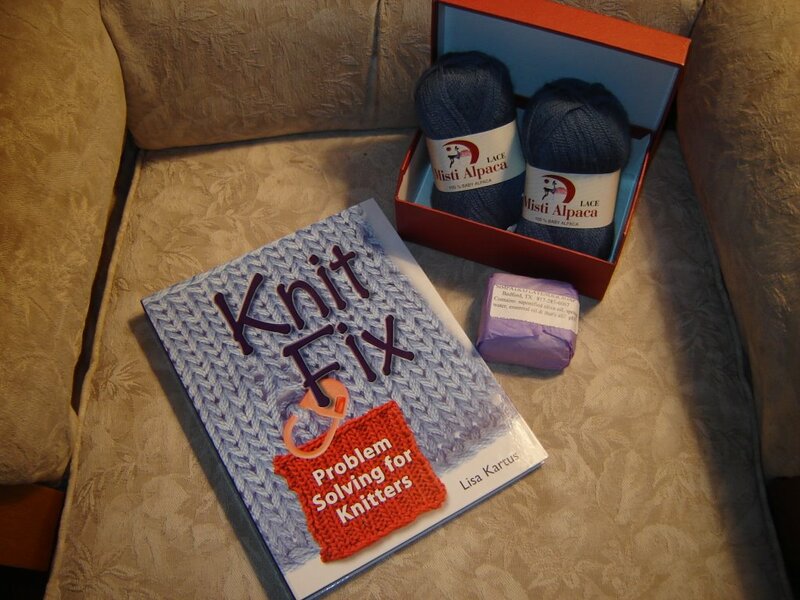 I got Knit Fix, which I’ve been badly wanting since it came out. Some laceweight Misti Alpaca in a beautiful blue-grey, and some handmade soap. I adore handmade soap and this is soem fabulous stuff. Now I just have to pick out a pattern for the alpaca. After Christmas I really want to get started on some lace. These early bedtimes are giving me hope yet. …and I mean no one, gets Thanksgiving until the laundry is washed, folded, and put away. Seriously. Or at least he looks like he just did. My poor guy, in his eagerness to go places, took a major digger into a pile of Leggos today. Face first. So between his scraped up nose, and the fact that he has a cold, which makes his eyes all red and puffy, he looks like he just got finished filming “Rocky: The Early Days.” Poor guy. I’ve decided that even though Little Man loves them, Leggos are evil. No matter how hard I try to pick them up, I step on at least one every time I got in Little Man’s room. Their sharp pointy corners hurt bare feet and tiny baby noses, an I’m seriously thinking they just have to go before they end up in a tiny baby mouth. But Little Man adores them, and will sit quietly forever playing with them. I try keeping them in his bedroom which actually works pretty well. But, we still need to go in there sometimes and then Knittybaby has to be watched like a hawk, which isn’t easy these days; he’s getting fast. I think I just need to stash them up in the closet for awhile. 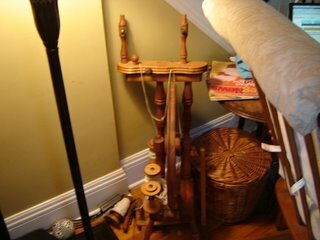 Notice the three year old spinning wheel abuse? We constantly battle the toy game in this family. First of all, we have on old, not so big house. This means we do not have a large playroom in the basement that we can fill up with whatever toys should come our way; I’m not sure we would want that anyway. We try hard to keep the toys in our house to a manageable amount, and those we have we try to keep high quality: no plastic, (except Legos), no batteries, and only things that encourage creativity. We also try hard to make as much as we can ourselves when Little Man shows an interest in something (and then hope that no well-meaning relative then buys him the same store-bought version later on). The result is usually that Little Man gets what he was wanting, learns something in the process of getting it, and feels an immense pride in the toy when it was done. I came home on Monday to find the Skeptic and Little Man had come up with the best version of this philosophy yet. Little Man and his friends like to play “swords” and I often tell him stories about kings, dragons, knights, and whatever crazy fairy tales I can come up with that involve him and his brother. The whole “do we let him play with toy weapons issue” has plagued us and is something for another day, I’ll just refer you to this issue of Mothering for now. He didn’t want to sit still to model for me, so you get the display version. The hat is one I made Little Man for Christmas last year. 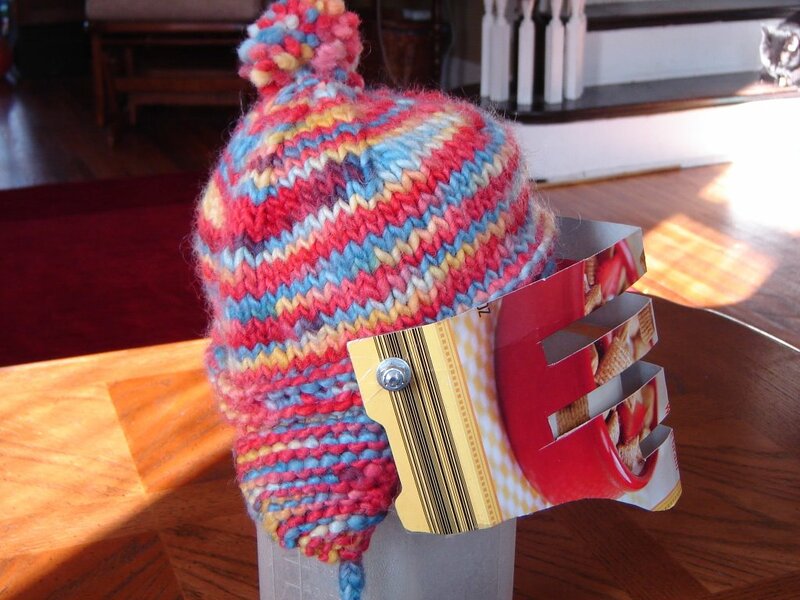 It is a Minnesota winter hat, which means it is thick, heavy, and made for the toughest winter. I knit it tightly on size 15 needles on some very thick hand died yarn from Blackberry Ridge. The yarn is very similar in thickness to Lamb’s Pride Burly Spun. I pretty much measured his head, got my guage, and threw it together last minute. Somehow, they got the idea to turn it into a knight’s helment. 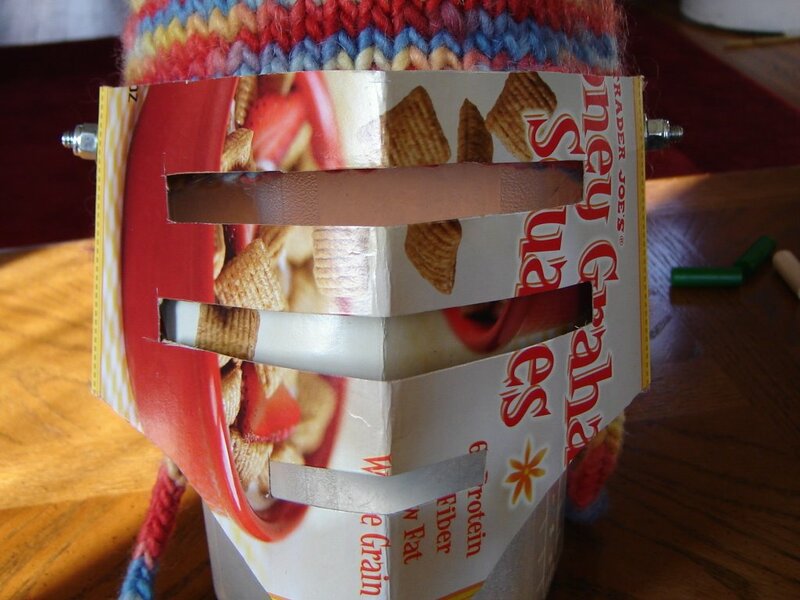 The Skeptic took a cereal box and cut it into the shape of a visor to go over his face. The Skeptic was going to decorate the plain side, but Little Man liked the outside of the box, which is why you see cereal on the front of the helment. He cut out three slits, and taped one longer piece of the cardboard under the middle slit. He then attached it to the hat with two bolts, so the visor can be lifted up and down. 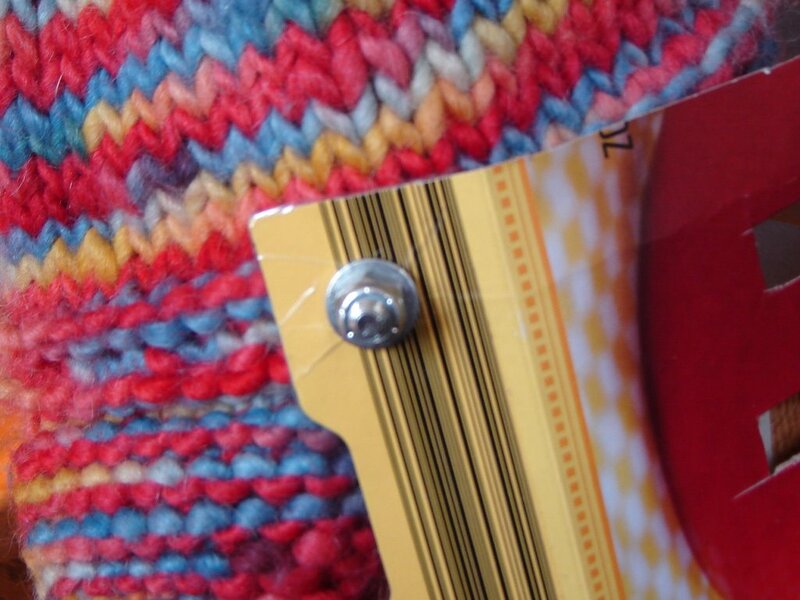 He then attached it to the hat with two bolts, so the visor can be lifted up and down. This is why you need a thick, heavy hat. Anything thinner will not hold the bolts on. Once you’ve got the visor attached, your helment is ready to go! This is not a finished product (or tutorial)by far. As soon as it get’s cold we’ll need to get the hat back for winter use. But, I envision this as a great project that I’d like to make with a much better tutorial. I imagine knitting this up and felting it to make it even heavier, without the tassles and pom-pom so it looks more like a helment. Then I’d make a more decorative visor by painting the cardboard with silver paint and embroidering some sort of insignia on the side of the helment. Add a cool cardboard or wooden sword and your little knight is ready to go! 4. How do you drink your coffee? In the mornings, black and very strong. Afternoons I like a latte or cafe au lait. 5. Favorite coffee ever? This is tough….I’d say Peace Coffee is my favorite brand. 6. Are you fussy about your coffee or will any old bean do? Yeah, I’m pretty fussy. I typically buy fair trade, organic, or from small local roasters. That said, Starbucks also makes a mean cuppa in a pinch as well! But, I’m terrible at actually remembering the blends and roasts that I like. I always forget what I buy. 7. Favorite treats to have with your coffee? Chocolate or cookies. 9. Yarn/fiber you love? Handpainted sock yarn, Malabrigo, Manos, any natural fibers. 12. Favorite colors? Just about everything except pastels, although I do love pink. I’m on a big pink/brown or blue/brown kick lately. 14. Anything you really love, really don’t like, or just need to get off your chest? I’m loving this swap and am glad I decided to set it up. I really don’t like that you can’t really teach elementary music and drink coffee at the same time. Trust me, I’ve tried. The little things are everywhere…. So Knittybaby is on the move. My peaceful existance (did I realy just say “peaceful?”) is over. No longer can I just clear a little area on the floor and plop him down. And no matter how hard I try to contain it, Little Man’s little stuff is everywhere. I think every other word out of my mouth is, “Crap, get that! It’s a CHOKING HAZARD!!! !” as Knittybaby does his beast to devour paper, plant leaves, and the wheels off his big brother’s trains. My ultra paranoia is starting to make the Skeptic a little bit crazy, who being a farm boy and all, tends to be a little less freaked out about things. When Little Man was small this age was easy. We had one small box of toys for him that were no problem. All I had to do was mop and let him go. This, however, is a new deal. Moms of two? How on earth did you handle this? I keep trying to keep the small toys upstairs but they migrate, everywhere!!! The sweater story is coming, seriously. But I need good pictures for you all, and I’ve been busy setting up partners for the coffee swap. But that’s done, it’s sunny day, perfect for a photo shoot.